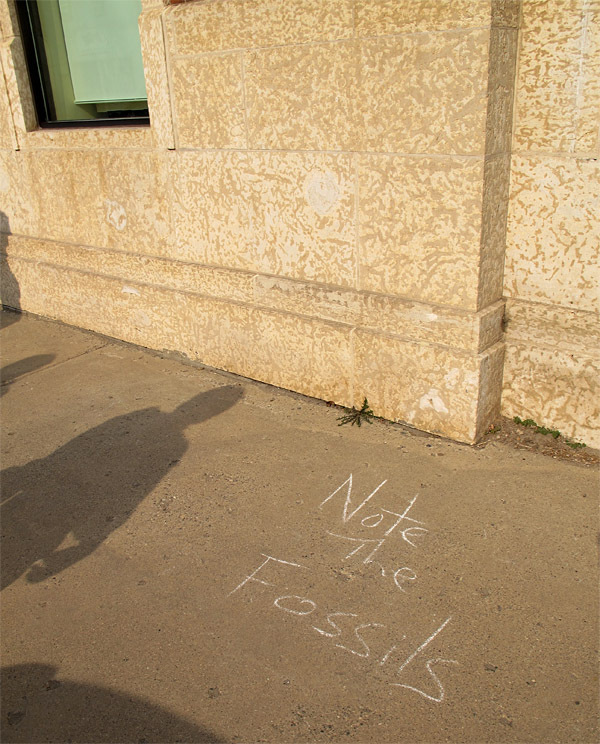 This anonymous graffito was chalked onto the sidewalk in Virden, Manitoba, last week, strategically placed below a beautifully Thalassinoides-mottled, Fisherites-laden wall. It was so good to see that someone out there gets it! I once was in a tiny bar in a remote part of the Australian desert – a ‘town’ of precisely 2 buildings, one being the location of the bar. The barkeep asked me and my 2 student field assistants what we were doing. ‘Hunting fossils’ I replied. ‘Look no further he said’, looking down at the bar. The whole bar, including the floor, was built from sandstone blocks covered in leaf impressions. Something similar happened to a colleague in British Columbia last year, only it was a fire place. Thanks Dave. We should be grateful that people take such an interest in fossils; maybe public interest will ensure that paleontology has a future? What great graffiti! You must have been delighted to have come across it! I was! Thanks for the comment. The stone from which the building is made is called Tyndall stone here, and it is everywhere in buildings in Southern Manitoba, from the Manitoba Legislature to humble home walkways. Consequently you never have to go far to see fossils. The Leg even has a brochure available just devoted to the fossils visible there. Thanks Donna, I should have mentioned that. I actually wrote the text for the Legislature’s pamphlet and have been meaning to write some blog posts about Tyndall Stone fossils; I will when I have the time! The original buildings of Brandon University feature Tyndall Stone with fossils, and the late 1980s Geology building at the University of Saskatchewan deliberately features fossil-rich Tyndall Stone in the display area for its dinosaur skeletons and throughout the building. … as does my Brandon home’s fireplace hearth! (another locale known to Graham …). By coincidence, I just did a post about fossils seen in public areas around Salt Lake City at http://qvcproject.blogspot.com/ Unfortunately, no one bothered to annotate them publicly for me. Hopefully we can help others see the wonders that are sometimes right in front of their eyes. Thanks Dan, I will take a look at that. It is really important to explain the fossils, because people develop so many odd ideas about them!